FCFA is training African scientists in new skills and methodologies to study the African climate. Nana Ama Browne Klutse participated in a week-long training workshop on climate modelling at the University of Leeds, organised by the AMMA-2050 project in December 2016. Nana Ama Browne Klutse is at the centre of Ghana’s efforts to understand the changing dynamics of the west African monsoon and how the country can steel itself for shifts in temperature and rainfall. Dr Klutse is the Manager of the Government of Ghana’s Remote Sensing and Climate Centre, with responsibility for running a national lab and training dozens of colleagues and students on the most effective methods to model and predict the west African climate. Last week, Dr Klutse travelled to top up her own skills as part of the Future Climate for Africa programme’s training – hosted by the African Monsoon Multidisciplinary Analysis (AMMA-2050) project at the University of Leeds. 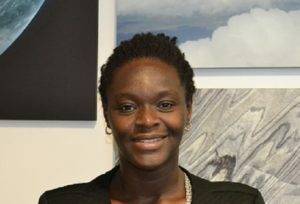 Dr Klutse explained that her motivation to study the west African climate has developed during an early research career in physics and environmental sciences: “I got my first degree in physics at the University of Cape Coast, and then a PhD in climatology at the University of Cape Town, then I returned to Ghana as a research scientist,” she related. “The issue of climate is a real concern to all and for those of us who are involved in the sciences, we know what is really happening – it’s alarming and it’s a call for concern for all. We really need to do something about it. While the length of the rains has shortened, she added, there is “not much change in the amount of rain,” meaning that rainfall has become more intense. This is creating flooding problems in the country and a host of impacts on agriculture: while flooding itself is a problem for farmers, the much longer dry season is also of concern. Society’s mismanagement of the environment has made some climate-related problems even worse: disturbance of soils by extractive industries like mining produces more dust; and forest depletion through unfettered logging is contributing to climate change – a problem in urgent need of mitigation. During her time in Leeds, Dr Klutse learned the computer language Python, which can be applied in a versatile way to many climate modelling platforms. “Python is more universal and flexible than the other languages we were using and has a wider user network,” she said. “For almost every question, you find an answer on the internet. I am happy to use it and apply it, I hope it will help us speed up a bit. We had hit some challenges with generating indices for the climate.” She will apply her new knowledge to generating metrics for the AMMA 2050 project. Image: Nana Ama Browne Klutse, courtesy Mairi Dupar, FCFA.